Kevin Kline earned a Best Supporting Actor Academy Award for his work in 1988’s A Fish Called Fish. While he deserved it, I can't help but feel that it slights the rest of the cast. Kline offered terrific work, but so did the other actors, and I remain somewhat unclear as to why Kline received the extra attention. Though Kline got the Oscar, he doesn’t work in a vacuum, and the rest of the cast also provide very strong performances. Jamie Lee Curtis shows a surprising flair for comedy as she plays Wanda, a mercenary young lady who will do whatever she must to make a big financial score. Especially when one considers that Curtis made her name as a "scream queen", her deft touch here seems especially pleasing. Two old Monty Python veterans round out the main cast. Cleese plays it relatively straight as barrister Archie and Palin takes a broader route as stutterer Ken. It probably doesn't help that Ken becomes at best a semi-good guy. He's definitely portrayed as a nice fellow, but he’s still a criminal and an aspiring killer, after all. A Fish Called Wanda appears in an aspect ratio of approximately 1.85:1 on this Blu-ray Disc. The image held up well. Sharpness usually looked positive. A smattering of soft spots emerged, but the majority of the film seemed fairly accurate and well-defined. I saw no issues with moiré effects or jaggies. With a nice layer of grain, digital noise reduction didn’t become an issue, and I noticed no edge haloes or print flaws. Wanda opted for a pretty warm palette, with nice reds and browns. The hues seemed well-rendered – I wouldn’t call them vivid, but they showed appropriate range. Blacks were dark and deep, and shadows usually appeared fine. A few low-light shots could be slightly opaque, but these remained in the minority. This was the best-looking version of the film I’ve seen. Remixed from the original monaural audio – which also appeared on the Blu-ray – the DTS-HD MA 5.1 soundfield remained restrained. Music showed good stereo imaging, and a little light ambience spread to the side speakers. That was about it, though, as surround usage was negligible. Other than the music, this was a glorified mono mix, so the other four speakers didn’t have a lot to do. Audio quality was acceptable. Speech occasionally showed a little edginess, but the lines usually seemed reasonably concise and distinctive. Music had good clarity though it lacked much range. This meant highs were slightly muted and lows lacked punch. How did the 2017 Blu-ray compare to the original 2011 release? Audio appeared to be identical, though I was happy the 2017 disc provided the original monaural, as the 2011 version omitted it. Visuals demonstrated a clear upgrade, as the 2017 transfer easily topped its predecessor. The new image looked better defined and cleaner, with stronger colors and blacks. This turned into a considerable improvement over the prior version. 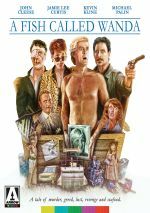 The 2017 Blu-ray brings back old extras and includes a few new ones as well. 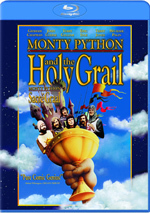 These start with an audio commentary from actor John Cleese, as he provides a running, screen-specific discussion. Cleese chats about the film’s origins and development, script and story issues, memories of director Charles Crichton, casting, performances and collaborating with the actors, the film’s depiction of London, and other production issues. The set also includes a Trivia Track. This text commentary gets into topics such as cast and crew, facts behind movie topics such as barristers and fish, and various production notes. These prove unusually good for this sort of program. We learn a lot of nice background info, not much of which repeats material from Cleese’s commentary. This ends up as a valuable extra. A Message from John Cleese runs four minutes, 56 seconds. Shot as a promotional element back in 1988, it shows Cleese as he touts the movie to American promoters – and does so in a humorously poor manner. It’s amusing and enjoyable to see. 26 Deleted and Alternate Scenes fill a total of 29 minutes, 37 seconds. That running time includes introductions from Cleese. He gives us notes about what we’ll see and lets us know why they cut the sequences. I agree with the majority of the edits, as most prove redundant or simply unnecessary. We also see some more graphic elements like blood related to the death of the dogs. Seeing these bits shows what a mistake it would’ve been to feature the more gruesome side of things, since those parts work only because they’re so cartoony. A few amusing moments emerge, and I especially like a discussion between Otto and Wanda about their relationship, and the subplot in which Otto uses cats’ tails for target practice. Nonetheless, most deserved their fate. John Cleese’s First Farewell Performance goes for 48 minutes, three seconds and presents a piece created concurrent with the film’s shoot. In addition to behind the scenes materials, we get interviews with Cleese conducted by Iain Johnstone. As with most featurettes of this sort, “Performance” works best when it focuses on shots from the set. We find lots of nice elements from the shoot, and these prove interesting. The interview segments add to the package as well and help make this an effective program. Next we get On Location. This 16-minute, 31-second program mixes elements. Film expert Mark Adams gives us some notes about the production while host Robert Powell provides a tour of Wanda locations. The next two segments are new to the 2017 Blu-ray. An Appreciation by Vic Pratt runs 16 minutes, 55 seconds and features the remarks of the BFI National Archive’s Pratt. He looks at the film’s history as well as an examination of its elements, cast, and other elements. Pratt delivers an insightful discussion. An Interview with Roger Murray-Leach goes for seven minutes, 31 seconds. Here the production designer chats about his work on the film. He gives us a nice array of details. In addition to the film’s trailer, we finish with an Image Gallery. Its 58 stills mix publicity materials and shots from the film. It’s a decent set. If you hunt, you’ll find some Easter Eggs, all of which can be accessed from the “Special Features” menu. Click to the right of “Trivia Track” to see an 89-second clip that shows an alternate version of the scene in which Wanda extracts information from Ken. Press right from “Image Gallery” for a 27-second outtake in which “Mr. John Cleese Shows His Thoughts On the United States of America”. Lastly, move right from “Trailer” for a one-minute and 43-second interview clip with Curtis in which she discusses subsequent gift exchanges with Cleese and gets interrupted by a phone call from husband Chris Guest. Cool fact: Curtis’s ring tone plays the theme from Halloween. Finally, we get a booklet. It comes with a 1988 essay from John Morrish and a 2017 piece from Sophie Monks Kaufman. Both add value. After almost 30 years, A Fish Called Wanda holds up nicely. The film barely shows its age and offers a droll sense of humor mixed with excellent performances. The Blu-ray provides very good picture and supplements along with average audio. Wanda continues to entertain, and this Blu-ray reproduces it well.